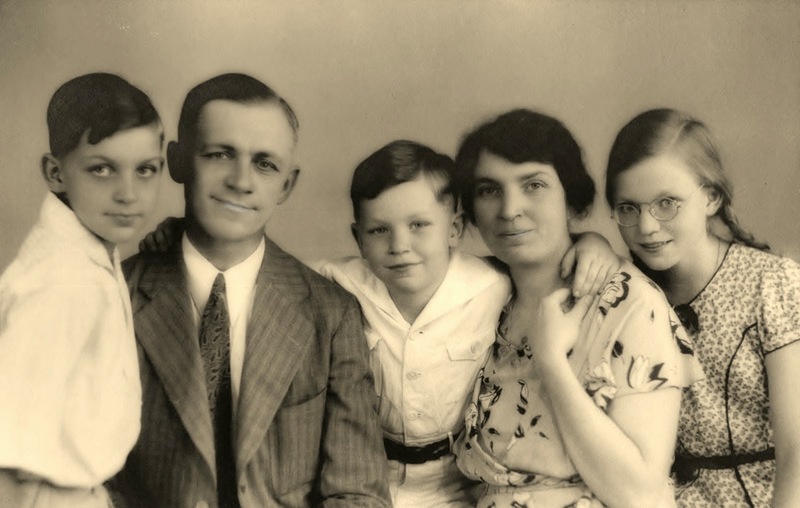 Portrait of Faith: Victor, Elam Sr., Elam Jr., Colena, and Frances Anderson, c. 1932. Christianity was never meant to be a legacy faith. Reading the oldest portions of the New Testament, it becomes clear that the first generation of Jesus' followers never expected a second generation to arise. In Mark 9:1, Matthew 16:28, and Luke 9:27, Jesus says that "there are some standing here who will not taste death until they see that the kingdom of God has come with power." In 1 Corinthians 7, Paul counsels the church to practice celibacy, so as not to be caught in flagrante delicto by the parousia. Of course, the Second Coming never happened, at least not in the way it was expected to, and every generation of Christians since has had to find a way to live eschatologically in a world that isn't going anywhere. The evangelical urgency of the gospels--of converting the entire world in fear of the wrath to come--lost much of its edge as churches had to shift their focus to forming the faith of children born Christian. The call to convert became a missionary vocation, as dedicated preachers ventured into pagan territory to win souls for Jesus. During the Crusades and the Inquisition, this drive took on a nasty tone, as conversions were now forced, at the edge of the sword or under pain of death, from persons who were themselves members of established world religions, some of them older than Christianity. With the Protestant Reformation came a new view on conversion: it was no longer good enough to be born into a Christian household, to grow up practicing and believing church dogma. One must make one's own decision for Christ, and have a personal relationship with him as Lord and Savior. It didn't take long, though, for the evangelical churches to fall into the same trip as the early Catholic church. The first generation of Protestants were all converts, whether from watered-down Catholicism or ungodly unchurched working class lives. Their children, on the other hand, grew up very much like their Catholic forebears, immersed in Protestant culture, rarely experiencing anything resembling a conversion. This didn't stop the more evangelical churches from continuing to hammer away at the importance of a conversion narrative, a personal story of how one came to know Jesus for the first time, however well-acquainted one might have been with him growing up. Over time, most Protestant churches adopted the Catholic practice of confirmation, the religious coming-of-age ritual of catechism and acceptance into full membership. It was hoped that the study and spiritual discipline of the confirmation program would trigger a personal conversion experience in the young person. In fact, though, I don't think I've ever met another Christian who came to Jesus through confirmation. I was no different. My family's Christian legacy is ancient: Swedish Baptists, Lutherans, Catholics, perhaps a few other flavors I'm unaware of. The stories I know best are of my grandfathers' journeys away from the faiths of their own families. Frank Richard walked away from Catholicism to become an American Baptist. Elam Anderson Sr. did the same thing, leaving behind the conservative Swedish Baptist faith of his parents to become a progressive American Baptist. Both experienced rejection by their families of origin, but eventually were welcomed back. My father and his siblings were all born in Shanghai, where my grandfather and his Lutheran wife (she didn't become a Baptist until they returned to America) were educational missionaries. Despite their faith, my grandparents were not in China to make converts, though the schools they oversaw had a religious component. China was gradually entering the modern era, and their work was to educate and equip young Chinese nationals for that transition. The Japanese occupation of China led my grandparents to abandon their work their and return to America, where my grandfather was president of two Baptist colleges prior to his death. My Aunt Fran remained active in American Baptist circles for the rest of her life; I'm not sure what Uncle Victor's religious life was like; and my father, after wrestling with his own vocation, became a minister. I expect my father's struggles with faith and calling were much like my own. Growing up in a household of religious intellectuals, he didn't have anything to be converted from, so the evangelical preference for dying from a sinful existence and being reborn into a life of piety was moot. I assume that's why, in raising his own children, my father never pushed us to have such an experience, either. We had the legacy of our ancestors, and every Sunday, we learned the lessons of faith in classes and from our father's sermons. This would, at first blush, appear to be an ideal atmosphere for forming young believers. In fact, though, our Christian education didn't stop with the lessons of Sunday School and sermon. Growing up in the parsonage, we were exposed daily to the seamy side of religion: the power games played by lay leaders, the judgmental glares of child-intolerant church ladies, and the bullying of the communities we lived in. We also saw the ways in which, for all his hard work at being the best Christian he could, our father occasionally slipped, storming up the stairs bellowing scripture to break up a fight between brothers, losing his temper during an argument, allowing an occasional oath to pass his lips. Most of all, we experienced the ongoing anxiety of always owing our livelihood to a community of cranky Christians. For all the disillusionment, I still wanted very much to be a Christian. I just wasn't sure how. It would've been much easier to learn about Christianity in the same way I discovered jazz: have it shared with me by an enthusiastic friend or teacher, find that it worked miracles for my psyche, and want to learn all about it that I could. Instead, I came to the table of conversion already loaded with more knowledge than many Christians acquire in a lifetime. In truth, I was born into this faith. Rebirth was going to be much more difficult.